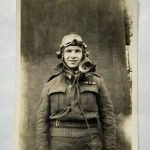 On the 30th March, we posted our first excerpt from Historica Canada’s Memory Project interview with RB396’s regular pilot Frank Johnson. In this part of the interview, Frank describes being shot down and becoming a Prisoner of War. You can find that full clip on our website here or on our Soundcloud page. Due to a slight edit issue, the clip overran and continued onto what happened next. We have had a few requests for the rest of Frank’s tale of his time in hospital in England. So, without further ado, we are happy to share this clip where Frank tells us what happened when he got to the hospital in England still suffering from serious back injuries. We hope you enjoy Frank telling us what happened next.